Now and then when I’m walking the dogs or daydreaming, I’ll think of a word or phrase or song from childhood that I never questioned at the time. The more I think of London Bridge falling down or the monkey chasing the weasel or “Jinx, buy me a Coke!” the more odd these memories seem. The other day, I came across one of those words in an article from The Grammarist, and I thought I’d pass it along to you. Dibs is a word used when laying claim to something. Calling dibs on something is an assertion of one’s rights. The idea of dibs, calling dibs or calling first dibs goes back to an eighteenth century children’s game called dibstones. Dibstones was a game akin to jacks, played with sheep knuckles. Children would announce “Dibs!” as they picked up each sheep knuckle, or called dibs. Eventually the term grew to include any instance when someone laid claim to something or asserted his right to possess it. For a time, dibs also referred to money. After reading that and looking for a photo of a sheep, I stumbled upon more information about this sort of game in Wikipedia. Knucklebones, Fivestones, or Jacks, is a game of ancient origin, usually played with five small objects, or ten in the case of jacks. 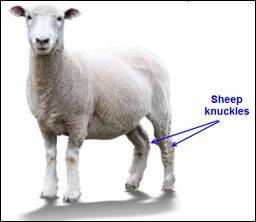 Originally the "knucklebones" (actually the astragalus, a bone in the ankle, or hock) were those of a sheep, which were thrown up and caught in various manners. Modern knucklebones consist of six points, or knobs, proceeding from a common base, and are usually made of metal or plastic. The winner is the first player to successfully complete a prescribed series of throws, which, though similar, differ widely in detail. The simplest throw consists in tossing up one stone, the jack, and picking up one or more from the table while it is in the air. This continues until all five stones have been picked up. Another throw consists in tossing up first one stone, then two, then three and so on, and catching them on the back of the hand. Different throws have received distinctive names, such as "riding the elephant," "peas in the pod," and "horses in the stable." I have dibs on this sheep’s knuckles!